Nagasaki (pop. 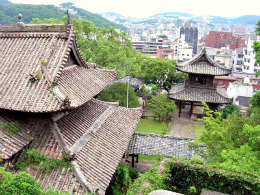 419,000) is one of the most well-known Japanese city for Westerners. That is where the first Europeans arrived in the 16th century, but also the only port that remained opened to foreign trade during Japan's two and a half centuries of seclusion. Finally, it is were the second atomic bomb was dropped by the United States on 9 August 1945, bringing the Second World War to an end (see Hiroshima). 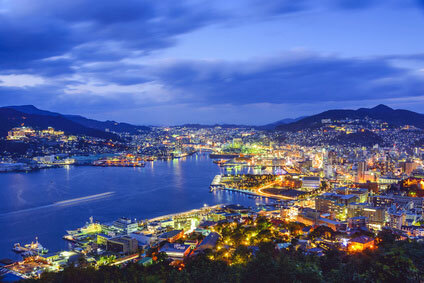 Nowadays, Nagasaki has fully recovered from its tragic destruction, and has become Kyushu's premier tourist destination, thanks to its history, unique geographic location and foreign influence - as much Chinese as Western. Although its population is just barely half a million inhabitants, it can easily compare to big cosmopolitan port cities like Kobe and Yokohama. Nagasaki was just a small fishing village before the arrival of the Europeans in the 16th century. The Portuguese were the first to reach Japan, in 1542, when one of their ships was blown off-course to Tanega-shima Island (in northern Okinawa). Two years later a small group of Portuguese merchants visited the court of Bungo (in modern Ōita Prefecture). The local daimyō, Ōtomo Yoshiaki, was much impressed by the firearms brought by the Portuguese, and invited them to trade foreign products in his domain. The guns introduced by the Portuguese would revolutionise warfare in Japan and allowed the next lord of Bungo, Ōtomo Yoshishige to unify most of Kyūshū in the 1550's. The great missionary Francis Xavier, who had been busy preaching in Goa and Malaysia, set foot in Japan in 1549. He travelled for 2 years from Kyūshū to Kyōto, but encountered little success in his enterprise. He managed to convert the daimyō of Yamaguchi, Ōuchi Yoshitaka, and a few people in Kyūshū. But Christianity had a foothold in Japan, and would lead, more significantly for the course of history, to the conversion of the feudal lord of Shimabara, Ōmura Sumitada, who ruled over the Nagasaki region. In 1562 lord Ōmura took the Christian name of Dom Bartolomeu and ordered the mass conversion of his retainers to the new faith and the destruction of Buddhist temples and Shintō shrines. Within 7 months, 20,000 people had been baptised, including the monks of 60 Buddhist monasteries. 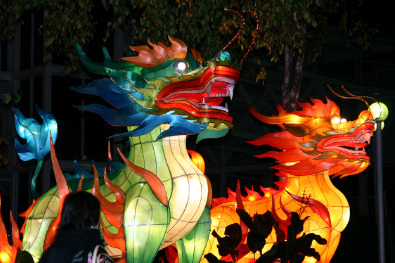 In 1555, the Portuguese set up a trading post in southern China, on the tiny island of Macao. They had learned of the voracious appetite of the Japanese for Chinese silk, and that the Japanese were banned from entering Chinese ports due to their long association with piracy. The Chinese were generally too afraid to venture to the Japanese islands by themselves. The Portuguese intended to profit from this golden opportunity, and soon were making enormous profits from the silk trade, bringing back galleons full of silver bullion from Japan. In 1571, the Portuguese opted for the secluded natural harbour of Nagasaki as their trading outpost. Their ally, lord Ōmura, ceded them the port completely in 1580. Nagasaki experienced a small economic boom thanks to the trade with the Portuguese. However, things were about to change. In 1587 Ōda Nobunaga passed away and Toyotomi Hideyoshi succeeded him as the new ruler of Japan. Hideyoshi immediately set about to crush the troublesome feudal lords of Kyūshū, and expelled Jesuit missionaries from Japan. Christians were to be persecuted for the many decades to come, the most famous examples being the crucifixion of 26 Christians (9 Catholic missionaries and 17 converts) in 1597, and the anihilation of the Christian uprising in Shimabara in 1637. Christianity was officially banned in 1614. From 1637, all contact with foreigners was banned and Japanese were prohibited to travel abroad or faced execution if they returned to Japan. The Dutch and Chinese were the only foreigners allowed to trade with Japan during this long period of isolation known as sakoku (鎖国 or "closed country"), and they were limited to small enclave on Dejima Island in one of Nagasaki's districts. Dutch books were permitted to enter the country again from 1720, and "Dutch knowledge" as it was called by the Japanese, influenced the scientific and artistic life of Nagasaki. The city re-opened completely to foreign trade in 1859. Nagasaki subsequently prospered with shipbuilding, which made it a target for the atomic bomb in 1945. Ironically, the bomb fell a few kilometers north of the center, in one of Japan's most Christian district. Many visitors to Nagasaki come to learn more about or pay homage to the victims of the Atomic Bomb. A simple memorial reminds of the visitors of the site above which the bomb exploded. Next to it is the instructive A-bomb Museum (8:30am to 5pm, ¥ 200). 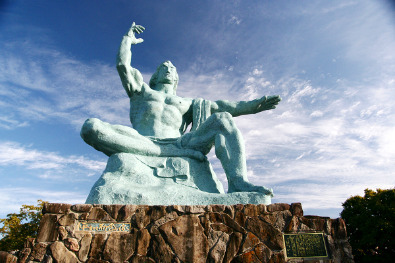 North of the hypocentre site is the Peace Park with numerous commemorative sculptures from around the world, dominated by the Nagasaki Peace Statue. From behind the statue, one can see the reconstructed Urakami Cathedral, which was the largest Christian church in Asia when the A-bomb was dropped in 1945. South of the A-bomb Museum is the the Suwa-jinja Shrine, with its half stone torii left as a reminder of the A-bomb. 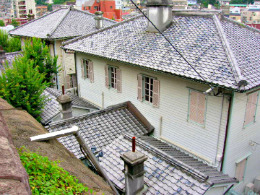 A few hundreds meters south of Nagasaki Station is the old Dutch district of Dejima. The settlement was an island from the 17th to 19th centuries, but has since become part of the city center due to land reclamation. 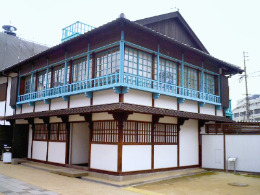 Many of the original buildings have been reconstructed using authentic materials. On the other side of Dejima is Nagasaki's small China Town, a good place to sample the local culinary speciality "champon" (noodles with meat and seafood). Just south of Chinatown, don't miss the Confucian Shrine (孔子廟, entry ¥ 500). It claims to be the only the only Confucian Shrine built by Chinese people for Chinese people outside China, and is on Chinese territory directly managed by the Chinese embassy in Tokyo. Originally constructed in 1893, it was entirely rebuilt after the A-bomb. The grounds used to host a primary school, which was demolished in 1982 and replaced by the Museum of Chinese History (same ticket as shrine). The museum has outstanding objects of all periods of Chinese history directly borrowed from top museums in China. Exhibits at the time of writing included a skull of the Peking man, first-rate Bronze-age objects, a gold crown of a Chinese emperor, world-renowned terracota soldiers from the ancient capital of Xi'an, the world's first seismometer, and 18th-century clocks made in Britain and China. 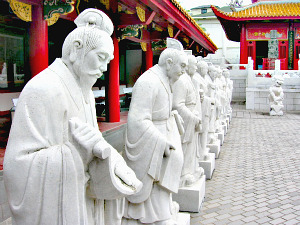 The shrine itself is remarkable for its collection of white stone statues of Chinese sages. Each statue is unique, depicted with great details in postures and facial expressions. The neighbouring hills of Higashi-Yamate to the East and Minami-Yamate to the South were settled by Westerners after the Meiji Restoration. Although dubbed "Dutch Slopes", its inhabitants were mainly British expatriates. The most famous of them was the Scottish entrepreneur Thomas Blake Glover (1838-1911), who has given his name to the Glover Garden of Minami-Yamate. The Garden commands magnificient views on the city and comprises 7 Western-style residences from the Meiji era. 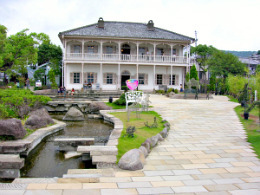 Admission to Glover Garden is ¥ 600 and includes the also interesting Nagasaki Traditional Performing Arts Museum. The white Ōura Catholic Church is at the foot of the garden. Immediately east of Nagasaki Station is the 26 martyrs memorial, dedicated to Christian missionaries and converts executed under the Tokugawa shōgunate. 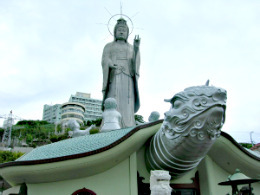 Not far from there is the Fukusai-ji Temple, easily distinguishable from the big statue of Kannon, the Buddhist goddess of mercy, on top of the turtle-shaped temple. Other attractions include the Shōfuku-ji, Sōfuku-ji and Kōfuku-ji temples. The Dutch history of Nagasaki is still alive in the theme park Huis ten Bosch, one hour by train north of Nagasaki. It is a reconstruction of a Dutch town with plenty of tulips, romantic canals and beautiful brick architecture so rare in Japan. In July 2015, Henn-na Hotel, the world's first hotel entirely operated by robots opened in Huis ten Bosch. Nagasaki is isolated between two peninsulas at the Western edge of Kyushu. There are direct trains to Hakata/Fukuoka (2h, ¥ 2,700), but few other tourist destinations. Most travellers will reach the city by air. JAL and ANA both have flights to Tokyo (Haneda), Nagoya and Osaka (Itami). ANA also flies to Okinawa. Nagasaki Airport is 50min from the city centre by train (¥ 800).